The first fire appears to have started near , where a skid was set on fire. 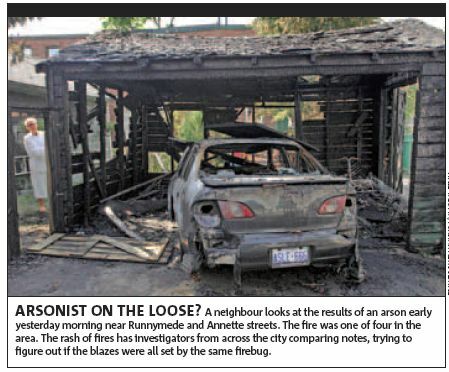 The arsonist is thought to have moved westward from there, setting three vehicles ablaze. In one case, a propane tank is thought to have been thrown into one of the vehicles, which was parked in a garage in a rear lane-way. (via E Ontario Now ). It’s all the more disturbing because its so uncommon. This entry was posted in Junction City, Life, Toronto by Ian. Bookmark the permalink.